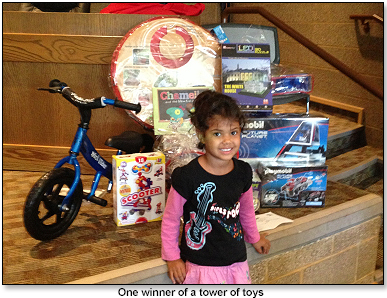 News :: Figpickle’s Tower of Toys Benefit - Glide Bikes - Balance Bikes for 18 months to 10 years old! In June Glide Bikes announced that it would be donating a set of balance bikes to help support their charity efforts this year! Figpickle’s Toy Emporium decided to raffle off two sets of “toy towers” and donate all the proceeds to JDRF, Juvenile Diabetes Research Foundation. We are pleased to announce that the fundraiser event was a HUGE success resulting in $2637.59 being donated to the foundation and two lucky young ladies received a Mini Glider! We would like to thank Figpickle’s Toy Emporium for their dedication to supporting a healthier tomorrow for children! Read the full article HERE.